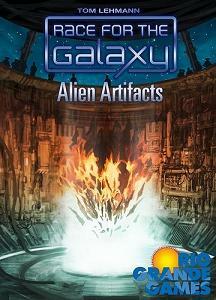 This expansion for Race for the Galaxy introduces 45 new cards and start worlds to add to the base set, plus a set of action cards and start hand for a fifth player, as well as the Alien Orb scenario, complete with cards and Alien tokens used to represent the Alien Orb which players jointly map and explore. Note: This is not a complete game and requires the base game to play. NOT compatible with any previous expansions.